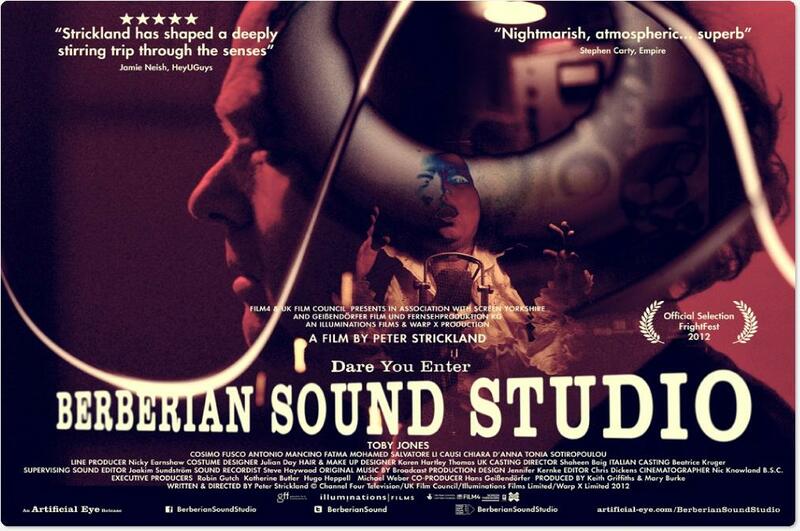 Some films are more difficult than others to describe in writing and Peter Strickland’s Berberian Sound Studio (2012) is certainly one of those. Perhaps it is because in a medium dominated by the visual language, this film communicates using the language of sound so to speak. 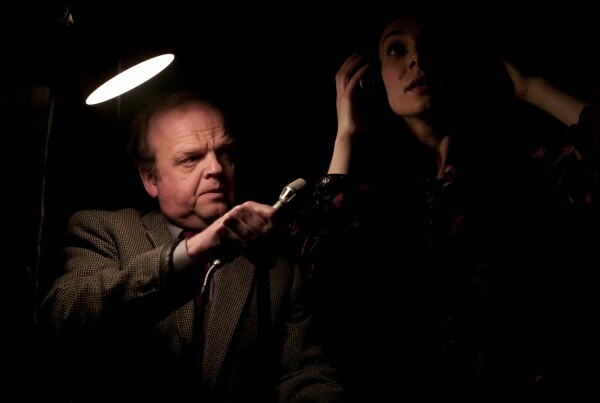 Toby Jones plays Gilderoy a documentary sound designer who travels to Italy to work on a film. What he does not realise is that the film is an Italian giallo horror flick which will have a great impact on him and more particularly his mental wellbeing. One of the truly original masterstrokes of the film is that whilst the characters continually see and are impacted by the film that is being made, we are never privy to the content of said film, as it always appears off-screen. It is a bold conceit that definitely pays off. It is tempting to say that this is a film about film. But really it is more a film about sound on film. The constant close-ups of sound recording and foley equipment are extremely reminiscent of Francis Ford Coppola’s The Conversation (1974) as are a number of other aspects of the film. To this end, the sound design of the film immediately draws you in and makes you listen closely to it. Some sounds are emphasised, some muted and the effect is to make the viewer pay close attention to the goings on of the soundtrack, as one would generally do for the visuals of a film. If you don’t have a really good sound system at home, then I would recommend that you watch the film with headphones, so you can more easily pick up all the nuance of the soundtrack. As far as constructing a period piece, Berberian Sound Studio ticks all the right boxes. The trimmings, clothes and interactions, appear truly spot on which makes this world of 70s giallo horror filmmaking really come alive. The contrast in clothes and mannerisms between the very British Gilderoy, who still lives with his mother and his Italian colleagues, is also starkly done. As an exercise in the creation of atmosphere, the film is a rousing success. All the filmmaking elements go to the service of creating a certain atmosphere on film, one that gradually becomes more and more loose and unhinged as perhaps our protagonist’s mindset does the same. Aside from the sound which I have mentioned in detail, the editing is the other technical aspect of the film that really impresses, especially the continual use of match shots, often incorporating very stark and strong imagery, to give proceedings a decidedly creepy quality. Toby Jones is always good, but he generally does his work in supporting roles. Here he is in the lead role and his character is a rather placid, retiring man. It is hard to really ‘own’ that kind of role, but he does it well, bringing some conflict and complexity to Gilderoy. Not an easy film to categorise, this highly creative psychological thriller is an easy one to recommend. You definitely do not have to be overly familiar with giallo film (I’m certainly not) to get a real buzz out of the tension that this film builds. Any film fan will be intrigued at just how the inner workings of the art are incorporated into this thriller. Nice review man! I thought this looked and sounded unbelievable, and I’m glad you mentioned the editing, it was superb. However, I thought the whole thing became a mess in the final third and just abandoned all narrative coherence. I still enjoyed it but I left it feeling rather bemused. Thankyou sir. I think most of your criticisms are pretty valid. I was happy enough to let them slide, mainly because of how original the rest of it was. I would be a little kinder and say it abandoned a vast majority of narrative coherence in final third, rather than all of it. I had not thought of The Conversation, but that is a very good comparison. Thanks for commenting. I can’t think of two films that focus on sound in the same way as those two. I didn’t like this as much as I wanted to. It was stunning visually but the story was too far out there for me. Yeah that is a far call. The narrative is not the film’s strong suit. I really want to see this. What do you think about the opinion that it needs to be seen in a cinema as the sound is such an important part of it? P.S Kilkenny is stinkin! Is stinkin good or bad? I think sound is a massively important part of the film. But I’m not sure if that necessarily means you have to see it in the cinema. My sound system at home is pretty average, so I actually watched it on my laptop with headphones which helped me pick up all the nuance in the sound. Yeah right on. It does work better as an experience like you say, rather than a coherent film. Definitely vague, but I personally didn’t find it too indulgent. I haven’t gotten to see this one yet, but I’m definitely going to. The comparison to The Conversation (one of my favorite movies ever) just makes me want to see it more. Good review. Cheers for commenting and glad I could get you enthused.